HTET 2018 application form is live now. The eligible aspirants apply the application form online through the direct link given over here. Board of School Education Haryana, BSEH has released the HTET 2018 Recruitment for the aspirants who are waiting for a long time. Interested aspirants can check the recruitment notification on the official website @bseh.org.in. The last date to apply HTET 2018 application form is 30th November 2018. The mode of applying the application form of HTET 2018 is online. The board will conduct the examination on January 5th and 6th, 2019. The board will provide the facility give the chance to aspirants to correct the wrong filled details. The candidates can edit and correct the details by using application correction window 21st November to 3rd December 2018. The Haryana TET Admit card 2018 will be issued for the candidates who successfully filled the application before the given last date. Scroll this page to get more about HTET Application form 2018. 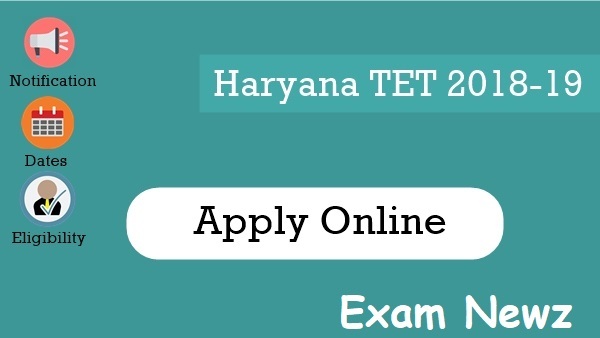 The interested and eligible candidates may apply for the Haryana TET Exam application form online. The aspirants need to fill the mandatory details and attach the required documents while filling the application form for HTET 2018. Click on the below mentioned official link. On the landing page, you have to click on ‘Proceed to Apply Online’. It will redirect you on a new page where you need to fill a few details such as applicant name, details of 10th exam, address, level for apply, and other required details as well. After filling the details, check the information and read the disclaimer. Check the small square box after reading the disclaimer. Now, click at the submit button. A new page will open on your browser. Upload the scanned copy of the signature, photo, and thumb impression. Click on the submit button appear after completing these uploading. Thereafter, the application fee payment page will open. Pay the application fee as per given on the website. The board only provide the online payment gateway to pay the HTET Application fee. The candidates can make the payment through Credit card, Debit card, or internet banking. The board does not provide the offline/ challan method to pay the application fee. After proceeding the payment submit button, DO NOT PRESS any button or refresh button that can cancel or error may occur while doing the transaction. After successful make payment, we suggest you check the payment status by login on the official website because sometimes the payment might be failed. Admit card or hall ticket is an important document to enter the exam hall. The board will release the admit card for HTET exam in the last week of December or first week of January, a few days prior to the examination. On the day of the examination, the candidates should bring one original photo id (aadhar card, Pan card, Voter id, passport etc) along with the admit card. The candidates who found any mistake in the application form can correct by editing the application form before the last date. We provided the link on this website to edit the application form. You have to click on the link and enter the registration number and password. Thanks for visiting this website. If you have any query then you can comment down. We will reply you with the proper solution shortly. Wish you good luck. Have a Nice Day!